For the past several years, drug shortages have become a greater problem within the United States. Supply issues has placed a large amount of stress on healthcare in both the inpatient and community setting. This has created large ramifications for practice, as providers have found themselves struggling to supply care for patients with limited resources at times. This can be especially problematic with medications already with little supply, such as chemotherapy. So what are causes of drug shortages? The causes of drug shortages is multifactorial. A report by the American Society of Health-System Pharmacists (ASHP) identified several contributing factors of drug shortages. Raw and bulk material shortage – Essentially a majority of the raw materials required for manufacture come from outside of the US. Disruptions in supply causes global ramifications, leading to delays in manufacture. Manufacturing difficulties and regulatory issues – A large issue that face the supply of medications is that there are limited manufacturers of some products. If any of these manufacturers encounter an issue, it puts greater pressure on supply over all. This is a large problem when there may only be several companies making a product that has a large demand (e.g. IV diuretics, opioids, benzos). This could be caused by failure of the company to comply with good manufacturing practices, causing the factory to be shut down and unable to produce for a period of time. Voluntary recalls – Sometimes companies will recall products and their associated lot production. This is often an issue if that company is the sole supplier for the product, causing a loss of overall supply. Manufacturers’ production economics – Not all products created may be financially sufficient for a company to continue production. This can be the case with generic medications that have a low return of profit for sale. As such, some companies will cut production lines, causing greater stress overall across the health system. Industry consolidation – Whenever mergers or companies consolidate, it causes disruptions across the supply chain that may take time to resolve. This is especially an issue when the companies are creating the same products and production lines are cut. Inventory management – Poor communication across the supply chain can lead to lapse in inventory management, causing drug shortages in health systems or lapse in stockpiling at wholesalers. Nontraditional distributors – Some distributors engage in the practice of buying medications in short supply to sell them at inflated prices to health systems during drug shortages. While a financially lucrative business, the obvious issue of creating a ‘grey market’ and questionable sale of products with an unknown pedigree is an issue. This list is not all inclusive, and set to change in the next few years as the FDA is working to address some of these issues in order to help prevent shortages or identifying upcoming shortages for providers. How can I keep up on current drug shortages? With all of the myriad causes of medication shortages occurring, it can be difficult for practitioners to keep abreast with the latest shortage and its impact on their practice. There are currently some websites and government sites dedicated towards identifying and keeping updated information on current shortages in the US. 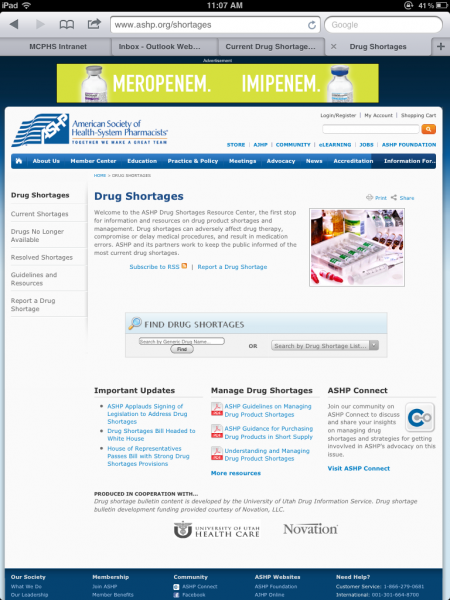 The FDA maintains a website dedicated to drug shortages currently an issue in the US. 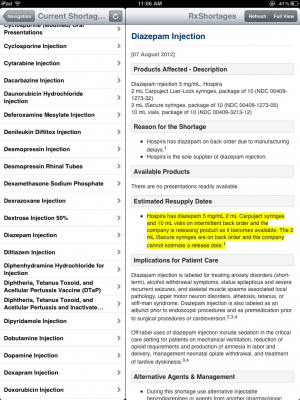 However, I personally like the ASHP resource on drug shortages, due to an easier layout to follow and read. For instance, reviewing a specific drug will supply the reader with all manufacturers available, and reasons for the shortage. There will often be some recommendation of available suppliers or alternatives to consider for providers or health systems. 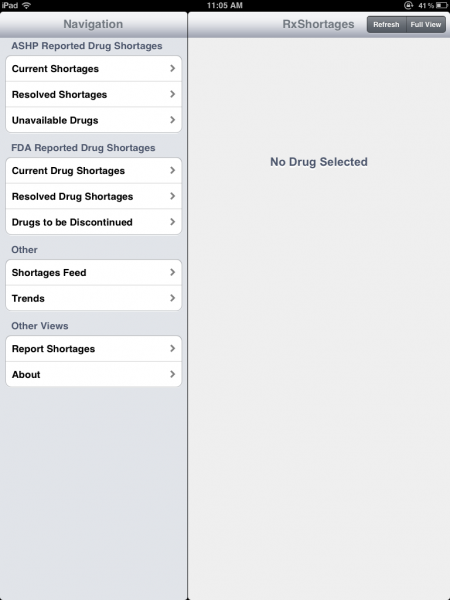 There are almost no apps that are dedicated towards drug shortages or management. Even drug information apps have little to no information on drug shortages. RxShortages is an app developed by Michael Schroeder, a PGY-2 Pharmacy Informatics Resident. 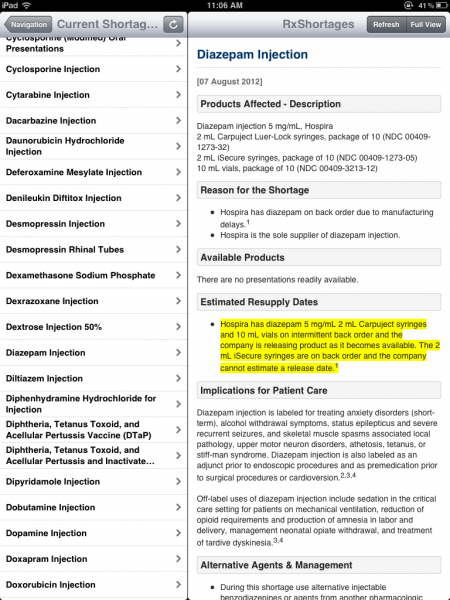 Essentially, the app serves as a resource on drug shortages, utilizing information supplied by both ASHP and the FDA. The app opens up to a navigation screen with ASHP and FDA reported drug shortages. There are several submenus for ASHP and the FDA for information on shortages. 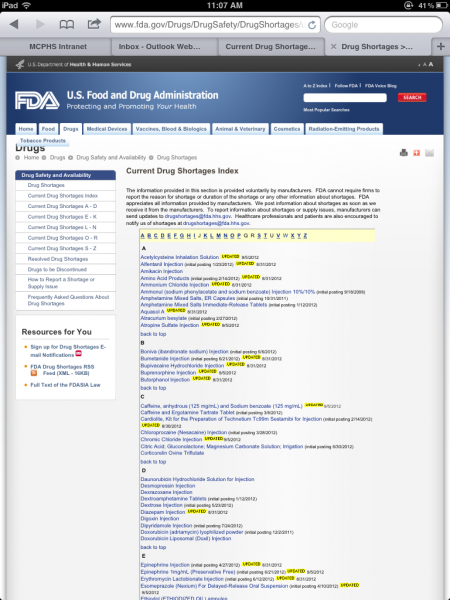 For instance, selecting ASHP current shortages, gives the user information on all current drug shortages supplied by ASHP in alphabetical order. Selecting a medication gives a synopsis on the drug shortage and associated information. If the user clicks on ‘Full View’ option in the top right, it will directly link out to the ASHP website mentioned before. 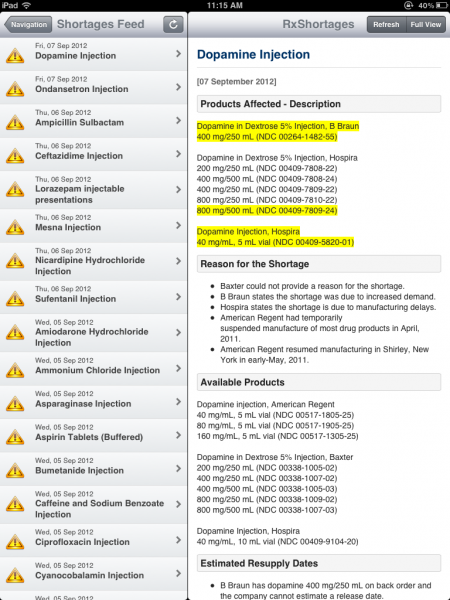 Lastly, there is a feed supplied through the app to give users daily information on new drug shortages. Who may benefit from this app? RxShortages is an app that seeks to help health professionals keep up-to-date on drug shortages in the US by utilizing information supplied by ASHP and the FDA. Keeping up on drug shortages is a time consuming task. Utilization of RxShortages may be beneficial for those that want an app with reliable information from the FDA and ASHP on current and ongoing drug shortages. ASHP Expert Panel on Drug Product Shortages, Fox ER, Birt A, James KB, Kokko H, Salverson S, Soflin DL. 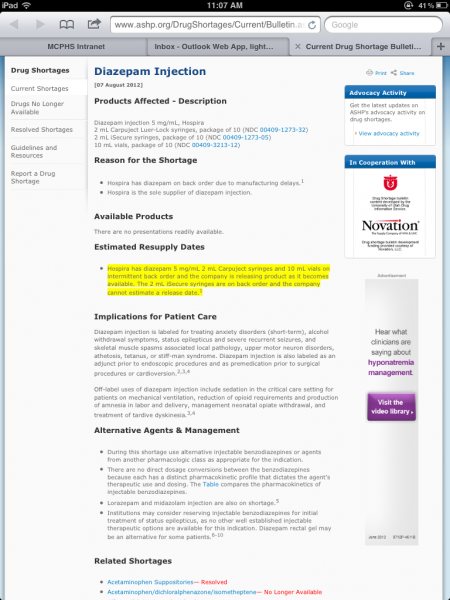 ASHP Guidelines on Managing Drug Product Shortages in Hospitals and Health Systems. Am J Health Syst Pharm. 2009 Aug 1;66(15):1399-406. Cherici C, McGinnis P, Russell W. Buyer Beware: drug shortages and the gray market. A Premier Healthcare Alliance Analysis. August 2011.